2015’s theme, “Where Wall Street, Main Street & Silicon Valley Converge” updates the vision of the summit established in 1997 on Martin Luther King Jr.’s birthday. Pushing King’s dream of combining justice and economics, the yearly conference teaches and engages conversation through esteemed lists of moderators and panelists speaking on everything from technology and faith to hip hop and strategic corporate partnerships. Some of those confirmed for 2015 include Black Enterprise’s President & CEO, Earl G. (Butch) Graves, Jr., moderating “The Role of Corporate Boards When Driving Diversity.” Newark, NJ Mayor Ras Baraka is featured on the panel, “Investing in Communities.” While a panel titled, “The Business of Hip Hop,” features rappers Rakim Allah, Rah Digga, Rick Ross, and Erick Sermon. To further the goal of corporate diversity in all industries, WSP works to report on inroads people of color have made in business. Earlier this year, WSP published its first study titled, “Minority Inclusion in Debt Capital Markets: A Ranking of Corporate Issuers.â€ The upcoming conference will unveil the second study on the utilization of minority asset managers by corporations and foundations. 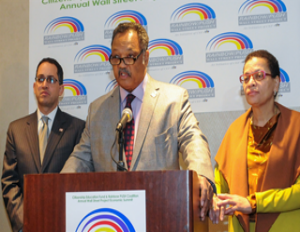 Working to bring more awareness and understanding to the issue, WSP plans a series of teleconferences with its founder Jesse Jackson to clearly explain and spread plans for 2015’s summit. This teleconference includes a multitude of entrepreneurial heavyweights like Graves, Baraka, Chief Executive Officer and President, Radio One, Inc./TV One, LLC, Alfred C. Liggins; Rev. Dr. Calvin O. Butts, Pastor of Abyssinian Baptist Church, and even hip hop royalty Rakim Allah and Erick Sermon.